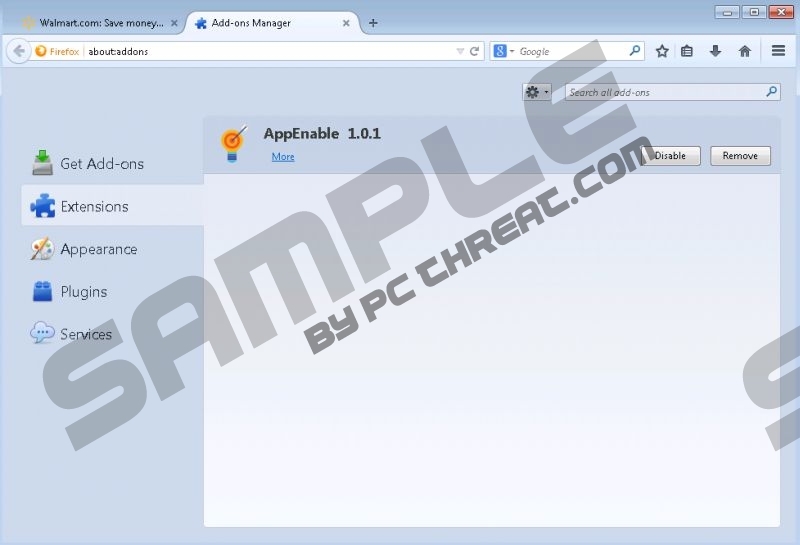 AppEnable is an adware application from the SuperWeb family. It will collect information on your web browsing habits and will create a customized stream of commercial advertisements that will pop up on your screen whenever you access online stores. AppEnable may look like a useful application that can help you save money on your purchases, but that is quite far from the truth. If you care about system’s security, you will remove AppEnable immediately. This adware application merely exposes you to potentially corrupted websites, so there is no need to keep it on your PC. Some users wonder as to how AppEnable enters theirs computers because they don’t remember having installed this application. The point is that all adware applications from the SuperWeb group (Key Lime Lizard, Rad Rater, Rock Turner Ads, etc.) get distributed bundled with freeware. Their official homepages are fake, and they do not provide any useful information on the applications. Thus, there is no need to check out appenable.info because it is not useful in any way. Since we have established that AppEnable arrives bundled with additional freeware applications, we can infer that if you most probably have more than just one unwanted program on board. In order to figure out which programs are potentially malicious, scan your system with the SpyHunter free scanner right now. Some users ignore AppEnable and simply keep this program on their computers because it does not pose any serious security threats. While it is true that AppEnable is not a malicious computer virus, we cannot overlook that fact that this program might be exploited by malevolent third parties that want to collect data for online marketing purposes or to distribute adware even further. The main security concern related to AppEnable and similar adware applications is that these programs do not review what kind of content gets embedded into their ads. So if cybercriminals want to make use of AppEnable for corrupted content distribution, they will definitely do so. In order to protect your computer from potential exploitations and malware infections, you have to remove AppEnable and other unwanted applications immediately. When it comes to adware, it is often possible to uninstall these programs via Control Panel. Luckily, it is not complicated to delete AppEnable manually. Once you uninstall the program, its extensions will disappear from your browsers automatically. However, do not forget that after manual removal you should get yourself a reliable antispyware tool that would ensure your system is fully protected from harm. Should you have any further questions about your system’s security, please do not hesitate to leave us a comment in the box below this description. Select Uninstall a program and remove AppEnable. Click Uninstall a program and remove AppEnable. Select Add or remove programs and uninstall AppEnable. Quick & tested solution for AppEnable removal.